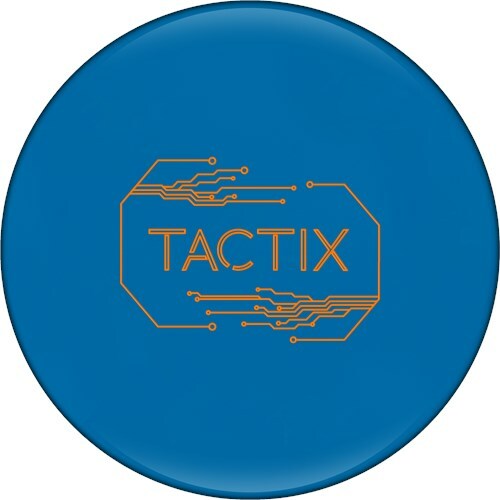 I have heard a lot of great things about this new Track Tactix and had to try it out to see what the buzz was about… WOW – this is an amazing ball motion for the Track brand. Versatility solid that can be used on a lot of various medium / heavier lane patterns. This is a stronger version of the original Track Legion Solid which is still in my tournament bag . The Tactix rolls strong in the mid-lanes and does not stop continuing through the pin decks. I have a similar layout on my Legion Solid, and the Tactix is about 2 feet earlier and same strong backend motion to handle the heavier lane patterns that most patterns now have. I think this is a great benchmark ball for most bowlers that love the Track brand which will be able to keep this ball in your hands a little longer than most other stronger equipment. I was able to chase left with the lane pattern and still have enough down the lane to create good angle to the pocket. This is an excellent piece from Track. The ball with a combination of the QR-9 solid with the Starship core provides excellent traction through the oil. The name says it all. I found the OB condition to be clean but really strong on THS. It would be best on medium to medium heavy conditions for most players. I took my ball to 4,000 abralon and found it gave me really good length with a super strong move off the friction. Now I can use this ball on both THS and most sport conditions. Track has a really good ball on their hands. If you are looking for a benchmark type reaction with the ability to tackle the fresh plus some transition, the Track Tactix is the one for you. Don't delay, go get one now. Dislikes: its almost too strong for its own good, I find that the typical move inside can sometimes be too much for this ball, and it will dump too much energy midlane to have anything left at the pocket. Especially on a house shot, this ball is just way too strong for most, so if you're a league bowler with any amount of rev rate, this ball will be way too strong. Its a nice benchmark ball for heavy and long oil patterns, but dont touch it for anything less than that unless you mess around and polish the daylights out of it. It looks like the other reviewers had the same concern for its strength. However, I haven't found a ball that I could really trust as much as this one, and with this ball I know almost immediately whether or not its going to strike by the arrows, and this ball makes sport shots look like house shot, so this ball is one of the best balls I've thrown in a LONG time. I will have to get another Tactix to see the stronger or weaker motion. I haven’t been able to get the ball to stop reading so early on house patterns which is what I expected when I put the layout on it (pin under the bridge of the fingers) this is a layout that I try with most bowling balls first. They are often too strong on house for me but work well on sport patterns. On the sport patterns I was able to play on the short medium and long patterns. The motion for me is smooth not too much off the friction and not that blast through the pins however, it finishes nicely through the pins. The Tactix is a going to be a part of my triple threat GB2, GB3, Tactix on various tournament patterns. Thank you for reading my review and thoughts about the Track Tactix! I don't want to bog down my reviews with copying and pasting all the relevant information of how I deliver a bowling ball, so I'll keep this portion brief. I am a rev rate dominant player who sticks to 2 layouts. With my Tactix, I used my low flare layout of 50 by 5 by 80, which places the pin below my middle finger. The motion of this ball is a medium response to friction that likes the fresher conditions. Even with using my lower flaring layout, this ball was not only quicker off the spot but also stronger than anticipated. I keep this ball at 1000 abralon pad to keep this motion on the fresh. Granted this ball is not the strongest in my bag, it came into play when the lanes are fresh and on the slicker side. I bowl in a challenge pattern league, which the first half was on a 47ft pattern, 5.19 to 1 ratio, with 30.45 mL of volume, contested on a high friction AMF SPL lane surface. The Tactix was a great ball to keep my angles in front of me during practice and through the 1st game, to give myself a little more miss room right when I begin moving left and going to a longer and quicker response ball like the Impact or Verdict Pearl. In local events, the Tactix has been a great ball on the fresh. I hope you consider the Track Tactix when you're looking for a ball for the fresh.